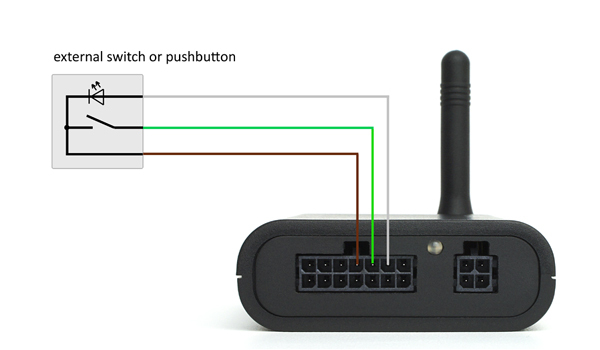 You can connect an external switch or pushbutton to the DANHAG APP-control. Pushbutton: Pressing the pushbutton will alternately switch on or switch off the heater. Switch: The heater will run as long as the switch is turned on. The maximum operating time of the heater is limited either by the heater itself or by the configured operating time. PIN 4, 5 and 6 are reserved to connect the pushbutton or switch. The connection cord of the pushbutton is about 150 cm in length. At the free ends of the cable are already crimp contacts mounted which can be easily plugged in into the connector. If you have the universal connection cord, PIN 5 (green wire) is already used. To connect the pushbutton, you will have to remove this wire first. If the heater is turned on, this PIN has a ground signal via a 560 Ohm resistor so you can switch e.g. a LED directly. This PIN is the switching input. The heater will run as long as there are is a +12V signal present. This PIN has a +12V signal permanently and can be used by the pushbutton or switch.